Every year when I file my taxes (which I actually have to pay quarterly), I wait for the IRS to send me a thank you note but it never comes. Today, I thought that it would be wonderful to have an app that would let you see where you tax dollars went. I did a search on the Internet an discovered that the White House actually has a calculator. You put the money paid Federal Tax and you can find out where it went. Lets say you paid $125,000 in federal tax. 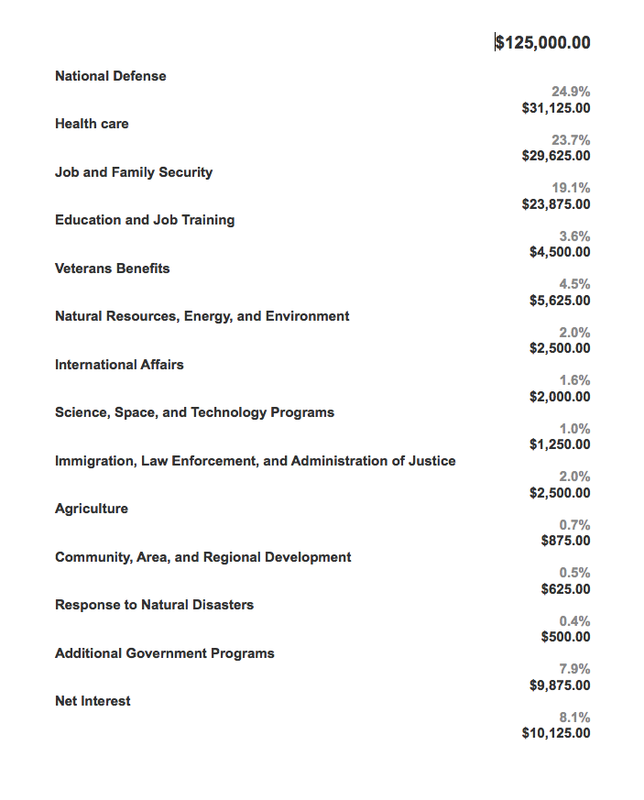 You would find out that you spent $31,125 for defense which is about 25% of your tax. However, this does not count the $5,625 for veterans benefits which I think are really part of the Defense Budget but instead shows up in separate category called Veterans Benefits. We can contrast this with $875 for environmental protection which means you pay almost 33 times as much for defending the country against other countries then defending the country against climate change. You pay even less for Energy and Conservation, about $625. Healthy and Food Safety does somewhat better at $17,500. The things that stand out clearly is that we spend way to much for defense. We have an army greater than the next twenty countries. Why do we need this force? I think the answer is simple. We need to spend this kind of money to keep the military/industrial complex happy. The NRA is nothing compared to those bastards that bleed our country by paying off the whores of Washington otherwise none as Congress. Not only do they drain our country of it wealth but they kill our young people in senseless wars to accomplish this. Tags: federal budget, tax policy, `. Bookmark the permalink. Jeez! Thanks for sharing that Avram. Ugh. I would bet that lobbying $$ in Washington (and state capitals) is proportional to these #s. Defense companies smartly set up operations in many, many states so they can summon more votes in Congress. Who are the lobbyists for education and job training?